Few years ago, my mother used to suffer from excruciating pain in her soles or rather her heels. The minute she put her foot down in the morning, after she got up from bed, she used to scream in pain. It was a torture for her to get out of her bed with pain akin to pricking of pins and needles as soon as her feet touched the ground. But, somehow she pushed herself to move about and do her work. The pain would slowly subside as hours passed by and as she went about her work and as the feet muscles warmed up. The pain would also occur after she would stand up after a prolonged period of sitting. An X-ray at the orthopedist revealed that she had a heel spur or calcaneal spur or heel spur. What is Calcaneal Spur / Heel Spur? A calcaneal spur (or heel spur) is a bony outgrowth from the heel bone. 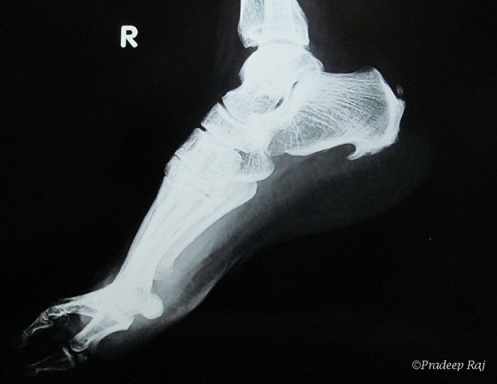 On an X-ray, a heel spur can extend forward by as much as a half-inch. Heel spurs is frequently associated with plantar fasciitis, a painful inflammation of the fibrous band of connective tissue (plantar fascia) that runs along the bottom of the foot and connects the heel bone to the ball of the foot. The calcaneal bone is the biggest bone in our feet and it plays a major role in absorbing the pressure and shock when we move and walk. How do heel spurs occur? Heel spurs occur when calcium deposits build up on the bottom of the heel bone. Over a period of time these deposits can pile up on each other, causing a spur-shaped deformity, called a calcaneal (or heel) spur. Calcaneal spurs are often caused by strains on foot muscles and ligaments, stretching of the plantar fascia, and repeated tearing of the membrane that covers the heel bone. Usually people who put too much strain on the foot are at risk of these condition, for example athletes. Age is also a factor; increasing age decreases plantar fascia flexibility and thins the heel's protective fat pad. People who wear high heels a lot, those wearing ill-fitting shoes, those running or jogging on hard surfaces without protective footwear, people with flat feet or high arches, obese or overweight people - all these are at a risk for heel spurs or plantar fasciitis. Knowing the proper reason for getting afflicted with this condition is an important part of the whole treatment process. In my mother's case it was increasing age and overweight plus her job demanded standing for long hours. * Use ice packs; the application helps to decrease the inflammation to a great extent. You might also try rolling your feet over a frozen water bottle. All this has a numbing affect and will help you to go about your daily tasks during the day. * This may sound contradictory, but using a heating pad on the area increases the blood flow and will help you to be up on your feet without much pain. * Do not walk barefoot inside your house, especially if the floor is hard as this can aggravate your symptoms. Wear protective slippers or flip-flops. * Never wear worn-out shoes, ill-fitting shoes and high heels if you have heel pain. It can aggravate your pain. * You should also not wear footwear that is completely flat. Your footwear should be such that it should be slightly raised or in other words your heels should be a little more higher than your toes when your wear your shoes. * If you go to the gym or embark upon any exercise regimen, it is important to do some warm ups first before engaging in strenuous physical activity. * If you are overweight or obese, you should try losing a few pounds as that will add less stress on your feet. It's good for your overall health and well-being too. * A home-remedy to relieve pain, inflammation and swelling in the heels / soles is to soak your feet for 20 minutes in a tub full of water at room temperature to which 1/2 cup of white vinegar is added.After the soak, rub in a good analgesic gel such as this. * Some other options for calcaneal bone heel spurs is to provide extra cushion in the heel area and to reduce inflammation. This can be done with the use of orthotic shoe inserts such as this and this. Then there are also night socks such as this for soothing painful heels and reducing swelling or slip on pads such as this for day wear. These are some very simple but useful guidelines for heel spur treatment. Doctors may prescribe medications such as acetaminophen (Tylenol), ibuprofen (Advil), or naproxen (Aleve) etc to relieve the pain. In some cases, they may recommend an orthotic device to correct the causes of heel and arch pain such as biomechanical imbalances. Sometimes an injection with a corticosteroid is also given to relieve inflammation in the area. Usually heel spurs do not require surgery and more than 90 percent of sufferers get better with nonsurgical treatments. Only if the pain does not subside within a year and is unbearable, a surgery is recommended by doctors. In my mother's case, her pain subsided within a matter of 3-4 months with a combination of self care treatments and medications for inflammation. It can be resolved with a combination of icing, rest, foot stretches and supporting the foot with an orthotic shoe insert specifically designed for this condition. Put your feet up for 20 minutes, 2 times a day. Rest is essential to recovering from Plantar Fasciitis. Changing the type of footwear may be essential.